For the last twenty years, Johnny Chan has been one of the most feared men at the poker table. With nine World Series of Poker bracelets including back to back wins in the main event in 1987 and 1988, he is near the top in career WSoP winnings. He’s married with six children and lives in Las Vegas where he is a cash game specialist, playing in the infamous Big Game with the likes of poker legends Doyle Brunson and Chip Reese. Johnny became a cult figure after the release of the poker film Rounders (1998), when he was featured in two memorable scenes playing himself. The first scene involved Matt Damon's character Mike McDermott watching the video of Johnny Chan playing heads up with Erik Seidel and winning the 1988 WSoP. The other scene was one of my favorites, when Chan butted heads at a high limit table with Mike McD at the Taj Mahal casino in Atlantic City and was promptly bluffed out of a pot. The 1998 WSoP win was a huge one for Chan, especially after he had lost the biggest pot in the history of the WSoP earlier in the tournament and came from behind to win his second main event. Nicknamed "The Orient Express", Johnny Chan was born in China and came to America with his parents via Hong Kong when he was a young boy. Growing up in Arizona and Texas, he worked in his family's restaurant and would often hit the casinos in Las Vegas with the money he saved up. Eventually he dropped out of college and moved to Las Vegas full time to pursue a career as a professional gambler. Like many young players, he had his ups and downs and took on plenty of different day jobs to survive all the bad beats and mistakes he made at the poker table. He eventually got a grasp on his game and became a more controlled and disciplined player. At the tables, he is fearless and aggressive. Despite being a feared player, he is well respected among his peers and known as a very likeable guy. He can also be found sitting in tournaments with an orange near his chips... his lucky orange, which he used as an odor freshener before the majority of poker rooms in casinos went smoke free. Other superstitious players took note of his lucky charm and brought a variety of fruits to the poker table in order to improve their down trodden fortunes. In 2002, Johnny Chan was inducted into the Poker Hall of Fame, becoming the first Asian-American to achieve that distinction as one of the greatest players of all time. He is also a well rounded poker player, winning WSoP bracelets in various events such as No Limit, Limit, Pot Limit, Seven Card Stud, Pot Limit Omaha, and Deuce to Seven Draw. Only Doyle Brunson and Phil Hellmuth have as many bracelets as Chan. 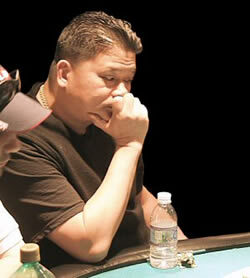 No matter what the game is, you don't want to be sitting at the same table with Johnny Chan. Johnny Chan will be known as one of the greatest players of all time. He also holds the honor of being the last person ever to win back-to-back WSoP main events. He almost won a third straight but lost to Phil Hellmuth in 1989. With the recent boom in the popularity of poker and the WSoP, it seems nearly impossible for someone to replicate Chan's back-to-back wins with the field of contestants projected at reaching over 5,000 players in 2005. Yes, Johnny Chan's back-to-back wins might become similar to Joe DiMaggio's 56 game hitting streak in baseball.... it will become an unbreakable record. Many players might try, but no one will ever match that feat again. Johnny Chan has been a consultant for different casinos and has written articles for Card Player Magazine. He once wrote, " I want to impress upon you the importance of treating your professional career as a business."